“I promise you guys it will get fixed. I’ll give everything in my heart and soul to get it fixed.” That was Jared Goff, star quarterback, in 2016 after losing his seventh game to start his career. The majority of NFL fans wrote Jared Goff as a bust, potentially the biggest bust in NFL History. Two years can change a lot in the sports world. 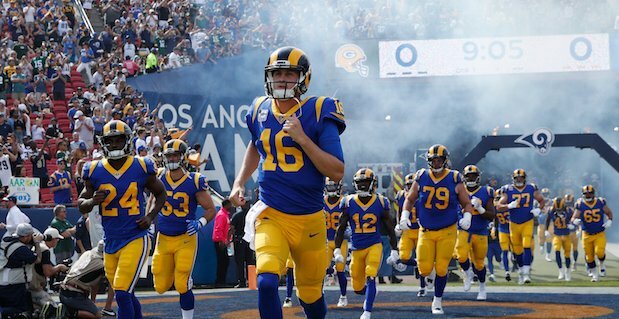 This question loomed into week 15 as the Rams faced off against the defending Super Bowl Champions, the Philadelphia Eagles. The majority of the media and fans assumed that this game would be a redemption game for the Rams offense. The Rams were heavy favorites at home, where yet again they failed to deliver. Fast-forward two months later, the Rams are down to their last straw. The Saints have the ball and need a field goal to win. It’s 3rd down and 10 as the Saints with future Hall of Fame Quarterback Drew Brees driving. Brees drops back to pass and as the ball falls incomplete following a monstrous hit delivered from Nickell Roby-Coleman in the secondary. Everyone, and I mean everyone, waited for that yellow penalty flag to be thrown. Yet, there was no flag in sight. The Rams went on to win one of the most discussed and debated Conference Championship games this sport has ever seen, in overtime. After all of the dust has settled, we now move on to discuss the biggest day in of all of sports, The Super Bowl. Plenty of Rams fans see this as a redemption game, The greatest quarterback of all time, Tom Brady, won his first, of a record 5 super bowl titles in the 2001 Super Bowl against the St. Louis Rams 22-19. This game is completely different, with a whole new set of headlines. Young vs. Old, New vs. Tradition, Offense vs. Defense and one of the biggest headlines for sports fans across all fields, Los Angles vs. Boston. The Rams spent their off season re-tooling their talent and shifting their focus to the “Win now” mentality. The Rams added cornerbacks Marcus Peters and Aquib Talib, defensive tackle Ndamukong Suh, and former Patriots wide receiver Brandin Cooks. The Rams are known for their high-flying, west-coast offense. They rank second in the league as far as total yards (418.5 yards per game) behind only the Patriots, and The Rams, led by running powerhouse, Todd Gurley, lead the NFL with Total Rushing Yards (175 yards per game) with the Patriots coming in at number two. These offenses match up very well together. On the defensive side, the Rams have the most feared player in the entire league in Aaron Donald. Donald led the league in sacks with 20.5, which also broke the all-time sacks record for defensive tackles. Donald, along with Suh, Captain Brockers and NFC Championship game hero Dante Fowler Jr., will have the most important job in this game, getting Brady to the turf. The key for the Rams to win this game will be on defense, despite the need to put points on the board, task number one will be to stop Tom Brady. Sean McVay, who is the youngest coach in Super Bowl history, is considered to be one of the brightest minds in the game today. Super Bowl LIII has a chance to go down in history as one of the best games ever, and so far it has been one of the most talked about. I believe the Rams will come out on top 31-24. I think the Rams will come out of the gate a little starstruck costing them the early lead, but going into halftime I think the Rams have more talent at every position except quarterback. This will allow them to come back and win what I predict to be one of the most back and forth 2nd halves in Super Bowl. Despite that the Rams will try and run down the Patriot’s throat with Gurley and Anderson, I believe the second half will come down to a classic QB shootout making the 24-year-old California native Jared Goff your Super Bowl MVP. ← Previous Previous post: Can you Imagine Not Being From Boston?